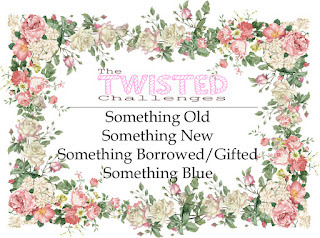 The Twisted Challenges is here with its 10th Challenge!! April has just begun and the heat wave is already soaring high in Mumbai. With all the sunshine we need some wings to flap in some breeze and thats exactly what we have for this month's challenge. 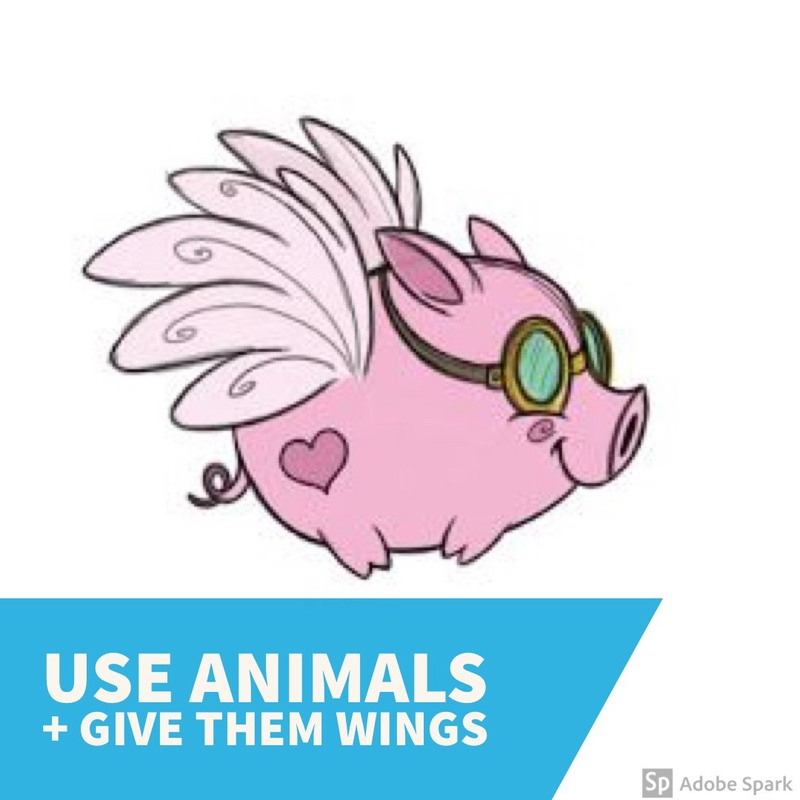 This month we want you all to use an animal/animals in your project and give them wings (please note: insects/bugs/butterflies and birds DO NOT qualify as animals. 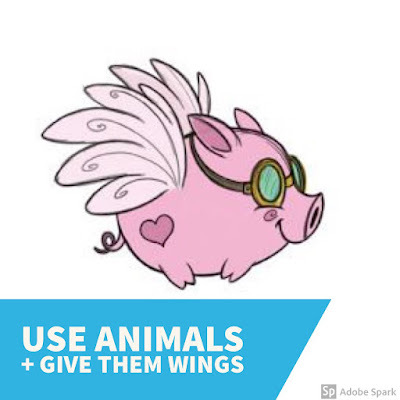 However, their wings do qualify to be used on the animal/animals). I have a sweet and a cute CAS card this month. I have taken a light blue Cardstock as the base of teh card and matted it with watercolour paper. I then stamped the two cloud image and coloured them using my zig markers. I have also coloured the background using blue and yellow shades. I have then stamped the image of the cow with the birthday sentiment and coloured it. 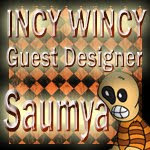 Post which I have fussy cut the image. I then stamped the wings on a vellum sheet using versamark and heat embossed it with black embossing powder. I have then stamped and heat embossed the stars with silver embossing powder to add more character and depth to it. I stuck the wings behind the cow image with fevicol and then raised the image with double tape to give dimension to it. I have then glued the tip of the wings to the watercoloured based to create more dimensions!! I love the way it turned out overall, but specially the dimmensions I could create through this project!! Some extra photographs to show the dimensions. I hope you like the inspiration and join us in our April Challenge. 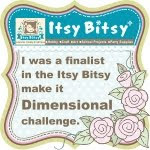 Do visit the blog and check out the other inspirations by our DT members and GDT. Be Thankful/ Grafteful + Use all colors of Rainbow! The March challenge at The Twisted Challenges is here!!! March for me is summer and Holi- both signifying a burst of colours and that's exactly what we want for this month's challenge. The theme this month is to create a project with Grateful / Thankful as the core sentiment while using all 7 colors of the rainbow! I have a card inspiration for this month and my inspiration is drawn from the rainbow cake which I love a lot. I have layered the top florals with double tape to give dimension and the two layers of florals are stuck to a script pattern paper from DCWV. Below it, taking inspiration from a rainbow cake I cut strips of cardstock in various colours and have stamped the sentiment on each strip . I hope you like the inspiration and join us in our March Challenge. 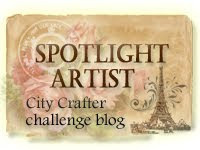 Do visit the blog and check out the other inspirations by our DT members and GDT. Hope the first month of the year is treating all of you with happiness and growth. I am having very hectic schedules with the marriage season blooming in both sides of my family (My Own family and My In Law side). But post my sabbatical from work and crafting full time I have recycled and upcycled many things. Thats also after my Decoupage skills were brushed by many mentors who are friends and my regular practice gave me confidence to play around and take risks that I would have never thought of few years back with respect to Crafting!! Hence, today as part of my second inspiration for this month's challenge at TTC I decided to upcycle some love. Love of my husband and a dear friend I made last year through the CraftyFeast. This month's challenge as you all must be now aware of is - Something Old, Something New, Something Borrowed/Gifted and Something Blue. 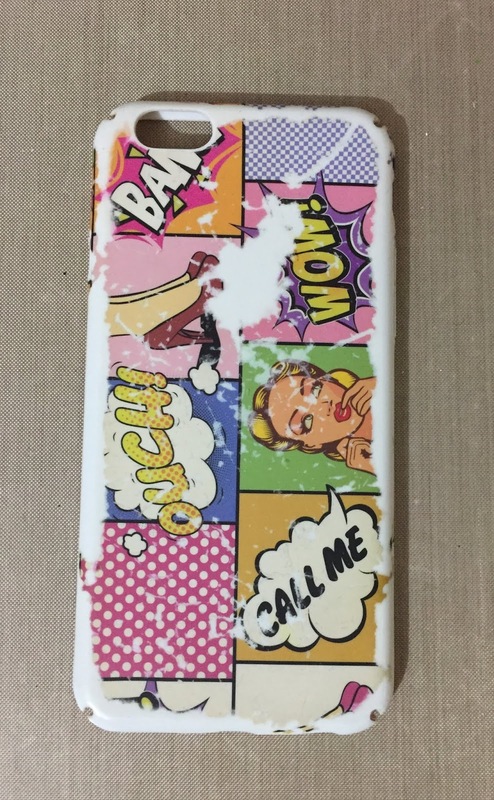 I have upcycled my birthday gift from husband - a mobile cover (Something Old). I loved the original but the design was wearing off and I didn't want to throw away something my husband gave me so I thought what best but create new memories in addition to the old ones. I first sanded off the entire base and then applied two coats of white gesso allowing it to dry for a good 3-4 hours between each layer. Once completely dry, I stuck the fussy cut design of a sassy looking lady from the Bob N Betty Decopatch papers that was gifted by a dear friend Deepika Sharma (Something Gifted). I have then taken my fvaourite Memory Box Stencil (Something Old) and my new Pebeo-Studio Acrylics (Something New) in the colours Blue (Something Blue), Green and Gold to create patterns around the lady. These new acrylics in my craft room have an in built shimmer and they look gorgeous in any project that they are added to! Once dry, I have taken the sentiment 'Hey Smartypants' from my new stamp set (Something New) and stamped it with black Archival Ink. After allowing sometime for the ink to dry, I have generously applied two coats of varnish allowing 3-4 hours of drying time between the layers. Now I have a totally awesome upcycled mobile cover .....I enjoyed making this project ...and I hope you enjoyed reading about it and get inspired to try your hands with something similar!!! Also I hope I have inspired you enough to join us with this month's challenge at TTC. Am overwhelmed with the number of participation at the The Twisted Challenges September Challenge and this month we are again here with a super interesting topic for our 5th Challenge. Fairy Tales take you to a dreamland, a world you want to believe in. They have their own conventional thoughts, myths, prejudices and this has remained intact for all these years. We thought of creating and adding a twist to these age old tales in our own way. Eg:- Snow White in the actual fairy tale was poisoned by her step mother with an apple. Keeping in minds the contemporary times she could have been poisoned through coffee so you could illustrate that scene from the fairy tale but instead of an apple the Witch Queen could offer Snow White a coffee mug. Having said the above, the scope of adding a twist is immense so shake yourselves up and rack your brains and while you do so I shall tell you the premise of my project for the said theme. In India, be it fairy tale or reality, a fair skin has its advantages. A family wants fair skinned daughter in law for their son. As a part of the television industry, I see biases to have a fair skinned female lead unless the story revolves around a dark skinned character. Terms 'Beauty' and 'Beautiful' are in many ways synonymous to fair skin. All age old fairy tales have fair and beautiful princesses and fairies and witches are dark and ugly and hence I decided to add a twist to this very old and outdated thought process through my project. I have knowingly coloured the existing fairy tale princess in all skin tones from fair, wheatish or brown to black and emphasised on the thought that beauty is not and should not be skin deep. We always say it 'Beauty lies within a person's heart' but in the real world dont actual practice it all the time and hence it is important to change the way we think. And also start young with our kids to instill in their minds that Beauty and Fair Skinned are not and can never be synonymous. I just hope that the publishers of these Fairy Tales also realise the mindset they might be influencing in young kids by making most princesses fair and labeling them beautiful. To depict the powerful message in a softer way, I decided to make it like a poster or framed wall art that could very well be a part of a kid's room. The frame is handmade with cardstock with the help of Elizabeth Craft die. 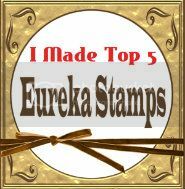 I have then taken some Disney stamps with the fairy tale princesses (from left to right-Sleeping Beauty, Little Mermaid, Snow White and Cindrella) and stamped them with Versafine Black ink on Canson watercolour paper. The image has been coloured using Zig water colour markers and then fussy cut. I die cut a banner on a cream cardstock to carry the sentiment. The sentiment is handwritten. All images have been attached to the frame with double sided tape to given them dimensions. 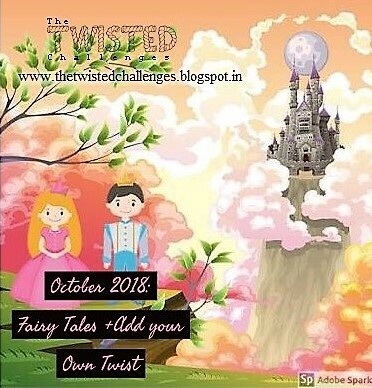 Hope you like the twist I have tried with the fairy tales and join us at The Twisted Challenges for our October theme. We have arrived at our 4th Challenge and when I look back I feel immense happiness at the response we have got till date. 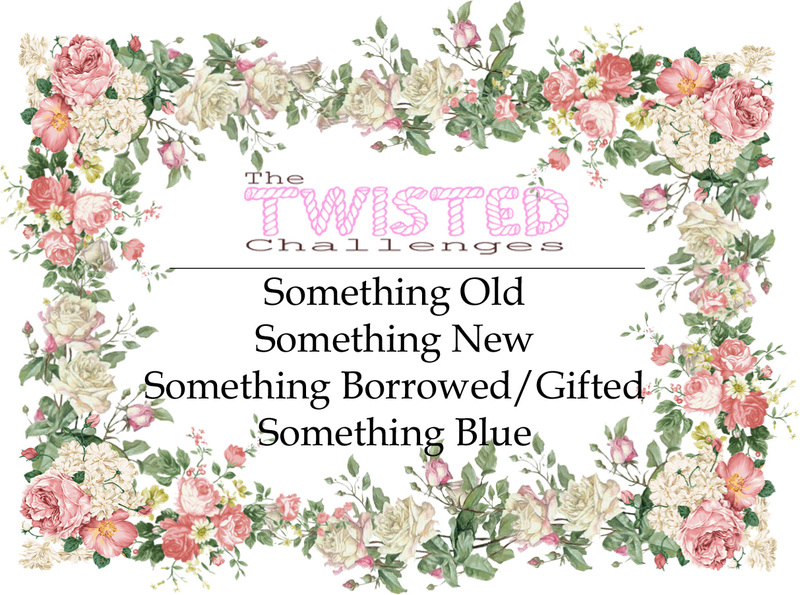 This month we have an interesting challenge at The Twisted Challenges. Celebrations with Monochrome may sound a bit off and some of you may wonder, how can one show celebrations with only one hue and its shades and tones. But thats the challenge, and to support it we are allowing neutrals -black, white, cream, grey and kraft in minimal use. I for one was super excited with the theme and wanted to challenge myself further. I chose to work with the neutral colours we have allowed, as at the end of the day some of them are pure hues after all! I chose the colour BLACK. Yes, you heard me right and I am celebrating 'Teacher's Day'. I have a couple of young teachers in my life and through this challenge am celebrating one of them. It’s not always about learning from elders.... sometimes we find ‘little teachers’ in our life walking in heights shorter than us but thoughts higher and far more pure than us. This is my niece Ananya Kaho Mohanty, and this photo is from my 2015 trip to Hong Kong. She has grown up not only in age and height but as a person too. My recent trip to Hong Kong showed me a far more responsible, competent and caring person than she was 3 years down the lane. She showed me and taught me that patience is the key word and that being happy is the most important thing. Things may go wrong and will always go wrong but being happy in whatever you do is the most important attitude one can adapt. This teaching was worth noting and celebrating and hence for my sweet and young 10 year old teacher, Happy Teachers Day. 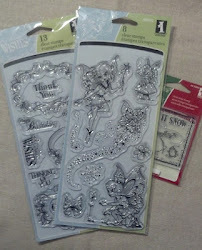 The butterflies are stamped with Versamark and embossed with white embossing powder. And a lot of stenciling has been done across the page with Catherine Pooler inks with shades of black and grey. The sentiment down has been stamped with Black Versafine ink on white cardstock mounted on a black cardstock. 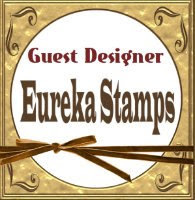 The sentiment 'World's Best Teacher' has been stamped with Versamark ink and white embossed and I have used Uniball white pen to create the stitched border on the banner of the sentiment. 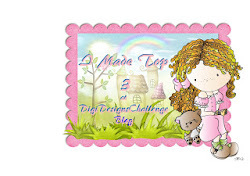 Hope you like this project and join us at The Twisted Challenges for our September Challenge. We are here with yet another challenge with a twist at The Twisted Challenges. So we need a bold sentiment to be the focus and the twist is to replace atleast one alphabet with an image. As this month is also the Rakhi month (In India, sisters tie Rakhi at their brothers hands to emphasis the love and bonding between them) I decided to make some Rakhi cards with above theme for my brothers. These are single base card as in like a postcard and have no opening or as we say inside of card element. And I have added my Rakhis for my brothers on the front of the card itself. I have taken the sentiment "Happy" to be my focus (Bold sentiment) and replaced the alphabet 'A' with a smiling girl standing and waving!!! In this card my focus sentiment is "SMILES" and I have replaced the 'I' with a Teddy Bear holding a balloon with a globe design on it. The globe balloon actually worked so well for me with the overall sentiment - Sending Smiles across the Miles signifying that the card was coming from one part of the world to another. 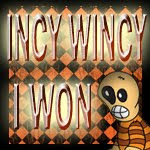 Hope you like my creation and join me in The Twisted Challenges.